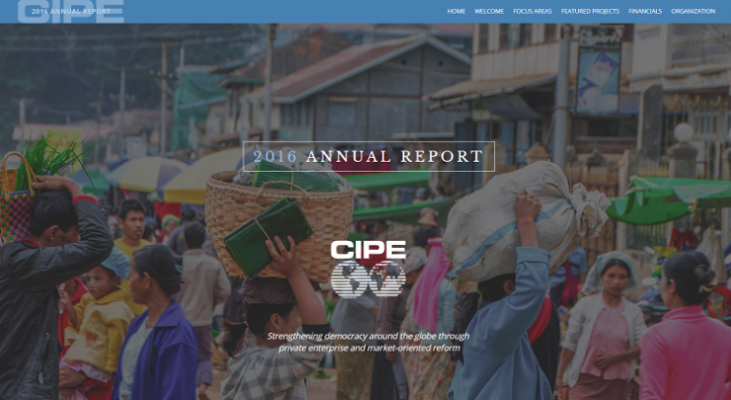 In 2016, CIPE worked on over 130 projects in more than 50 countries. With projects spanning the globe, CIPE supports democratic and economic development in some of the world’s most challenging regions. Working in countries ranging from young and transition democracies to authoritarian non-democracies, CIPE programs build space for the private sector and civil society to function, promote sustainable economic growth and inclusive economies, foster transparency and accountability in governance, and help entrepreneurs all over the world have a greater say in the policies that affect their businesses and lives. Read the 2016 Annual Report here.